Hannah Gamble is working on her second book of poems. She is the current artist-in-residence at Chicago's Museum of Science and Industry. Recent poems appear in The Believer, POETRY, and the American Poetry Review. She lives in Chicago where she performs with the band Everything's Alright, and, occasionally, Slurp's Up. 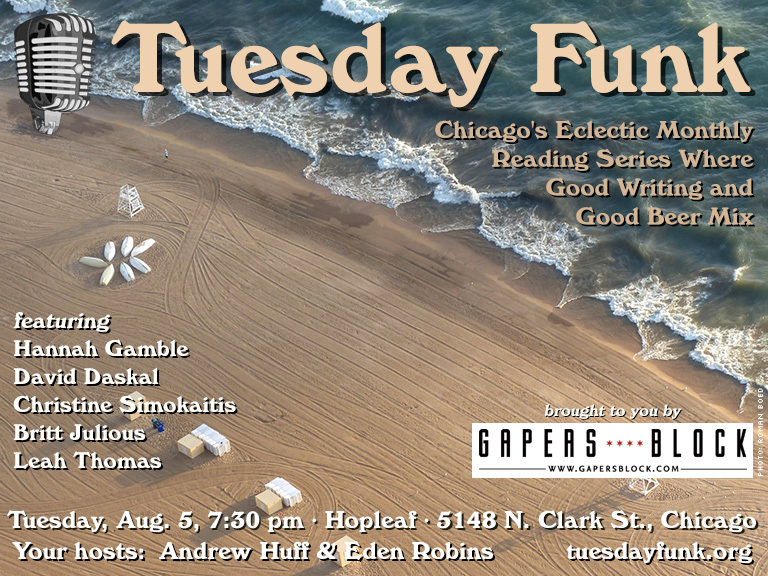 Please join Hannah and all our incredible readers on Tuesday, August 5, 2014, upstairs at Hopleaf at 7:30 pm. This 21-and-older event is free. It is with deepest regret that we inform you that Lawrence Santoro, writer, podcaster and so much more, passed away July 25 after a brief battle with duodenal cancer. He was 71. Gapers Block has an obituary. Larry read at Tuesday Funk twice, in January 2012 and June 2013. Here he is reading "Root Soup, Winter Soup." Memorial services are set for Friday, Aug. 1, at Lakeview Funeral Home, 1458 W. Belmont Ave. Viewing of closed casket is from 5 to 7pm, followed by a short memorial service at 7pm. In lieu of flowers, please donate to the American Cancer Society, noting that you would like it to be earmarked for research into duodenal cancer, or to Imerman Angels, who provide one to one support for cancer fighters, survivors and caregivers. A toast and celebration of Larry's life is planned for sometime in September. Christine Simokaitis' fiction and creative non-fiction has appeared in Calyx, Natural Bridge, Matchbook, Frigg, and many other print and on-line journals, as well as the anthologies, Are We Feeling Better Yet? Women Speak about Healthcare in America and Mourning Sickness. She earned her MFA from Goddard College in 2001. Her work has been shortlisted for, most recently, the Subito Press 2013 prose manuscript competition, and she was nominated for a 2014 Pushcart Prize. 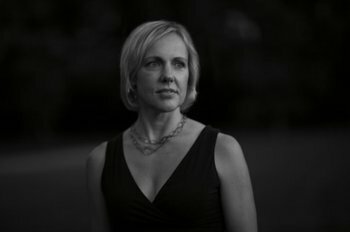 She currently teaches creative writing and composition at Northeastern Illinois University and lives in Chicago with her husband and two sons. Please join Christine and all our accomplished readers on Tuesday, August 5, 2014, upstairs at Hopleaf at 7:30 pm. This 21-and-older event is free. Britt Julious is a born and bred Chicagoan with a curiosity for weird, synthy music, shiny clothes, crappy television, and snappy pieces of really, really good writing. In 2014, Britt founded Inland, an online and print publication examining contemporary Midwest culture. 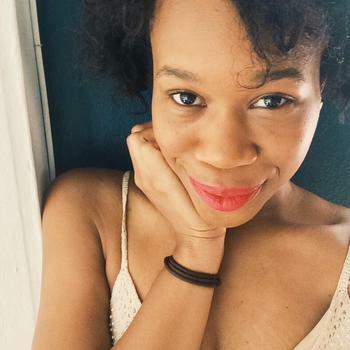 She also writes for a variety of different publications and organizations including Vice, where she is the Chicago contributor, WBEZ, Pitchfork, Complex, and Rookie. 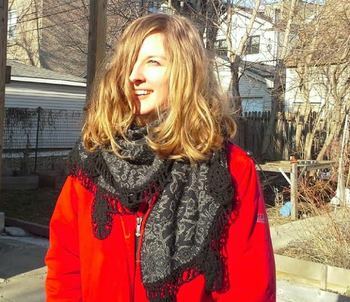 In 2012, The Chicago Reader named her the city's "Best Local Writer Who Excels at Social Media." She is a champion for the underdog and a proud Black Hippie. 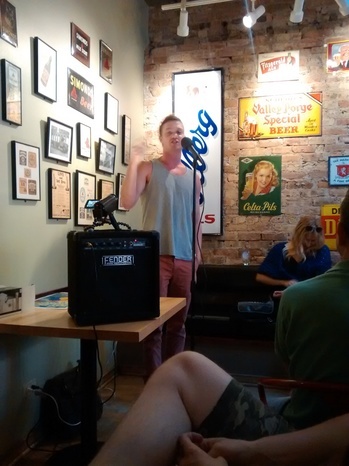 Please join Britt and all our excellent readers on Tuesday, August 5, 2014, upstairs at Hopleaf at 7:30 pm. This 21-and-older event is free. 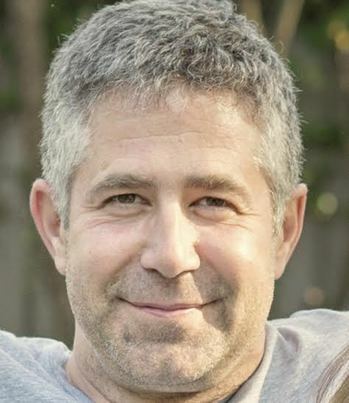 David Daskal is a Writer, Salesman and Family Dude living in Chicago. He has written and starred in five one-man shows around Chicago including The Pursuit of Happiness, The Generic News Hour and Habitat. 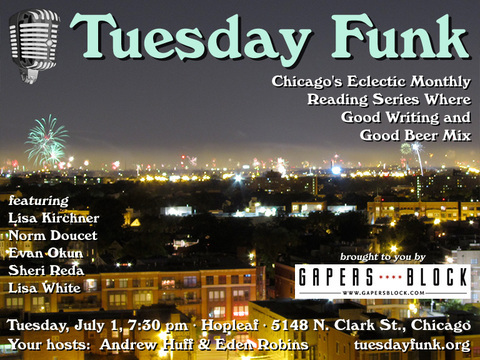 Please join David and all our other fantastic readers on Tuesday, August 5, 2014, upstairs at Hopleaf at 7:30 pm. This 21-and-older event is free.